Kenyan braised collard greens and ground beef, also known as Sukuma Wiki, is quick and SUPER easy to make – perfect for when you’re craving something a little more exotic with pretty common ingredients. Sukuma wiki is the Swahili name for collard greens which translates to “push/stretch the week”. In East Africa they use collards to stretch out a meal so it lasts the whole week, so as you can imagine this dish is very economical. 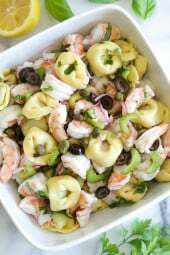 A few of my favorite African-inspired dishes are North African Spiced Shrimp and Chickpea Salad, Moroccan Meatballs, and Slow-Cooker Chicken and Sausage Creole. 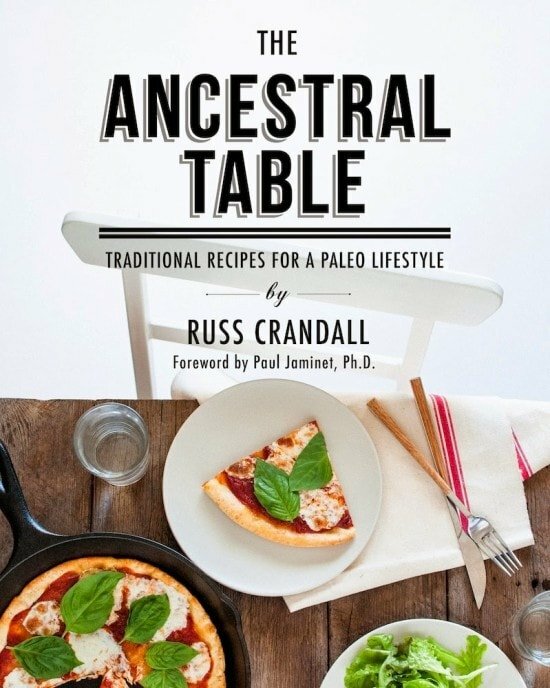 I’m super excited to share this recipe from my friend Russ’s new cookbook, The Ancestral Table: Traditional Recipes for a Paleo Lifestyle. His cookbook has tons of great International recipes each with a bit of history to go along for each dish as well as stunning photography. that doesn’t mean I can’t enjoy meals that are Paleo-friendly and his book has so many exotic dishes I plan on trying soon. 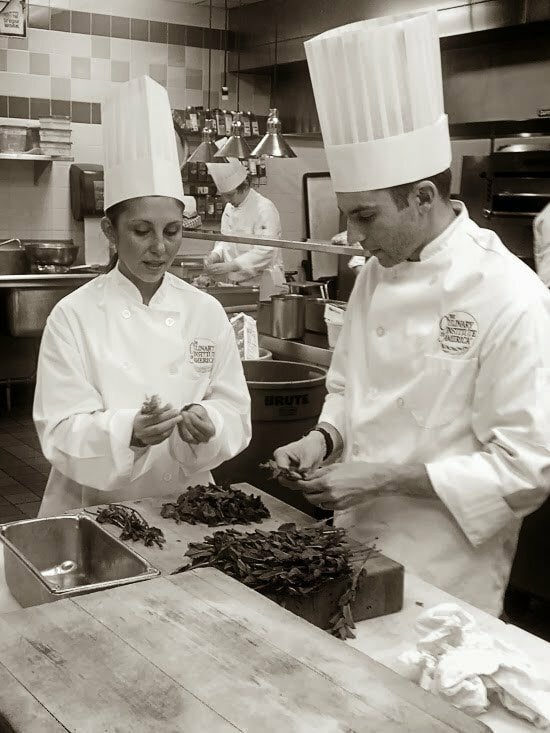 I met Russ of the Domestic Man on a tour of the Culinary Institute in the Fall where we cooked side by side in one of their classrooms. We were both working on our first cookbooks, so while we shared our experience together a kitchen together, we also shared stories of food, writing and more. Hope you enjoy this dish! Warm the olive oil in a large skillet over medium heat. Add the onion and saute until soft, about 4 minutes. Add the garlic and jalapeño and saute until fragrant, about 1 minute. Add the ground beef and seasonings and cook browned, about 6 to 8 minutes. Add the collard greens and tomatoes and saute until wilted, about 4 minutes. Stir everything gently as it cooks, careful not to mush the tomatoes. Add the lemon juice, season with salt and pepper to taste and serve. Simple and quick recipe! Thank you, I didn’t have cherry tomatoes on hand so I diced up a tomato, which camenout great. I did add a bit of all spice while browning the meat in addition to the rest of the other spices. I didn’t make this to the T as I was lacking a few ingredients. I honestly pulled some blanched collards and ground beef out of my freezer and googled what to do with collards and beef. Your recipe came up. I don’t have ground ginger on hand, so I used finely minced ginger. I didn’t have cherry tomatoes but had a couple ripe Roma’s that I cut up to suffice. I am out of turmeric and coriander so I just eliminated them. I used crushed red pepper in place of the jalapeños.I served with couscous. My family loves it!Thank you for such an easy and different recipe that even my sometimes picky son devoured. I like the reviewers idea of adding some sweet potato chunks. That sounds like it might make it in the next batch. Delicious. Excellent dish. Taste very good. Came out just like the picture. Fantastic, I made this with lamb instead. I simmered the greens in water nice and slowly to soften them up because of the comments about them being tough and chewy. Next time I will be doubling the spices though. Very good dish. Going to throw it in the instant pot! Loved it but added the rest of the bunch of greens and more tomatoes to the leftovers. I think I might like a diced sweet potato in there too. Oh my yum!! This was so incredibly flavorful and relatively easy. My husband and I loved it and we will be making it again. I was out of turmeric so I used Penzey’s sweet curry. Super yummy recipe, it’s now one of my go-tos. I add sliced baby bella mushrooms too. I didn’t know what to expect, but this dish was amazing. My daughter has a fish allergy and she recently transferred to a college farther away, so my husband and I have been eating fish nonstop! I started to crave beef and found this recipe on your website. I’m so happy I did! Made this last night, but substituted ground bison for the ground beef as it was on sale at the store. So good and so easy, will definitely make again! Do you drain the meat first??? We loved this! Used kale instead of collards but followed the rest of the recipe. Will put in rotation! We made this with Mixed Greens from Trader Joe's and ground turkey. We did also add a dash of coconut oil. This recipe is so delicious. We do make it on a regular basis. Made this last night and it was so good! My 2 and 4 year old loved it! I omitted the jalepeno, but used a bit of coconut oil which added great flavor, and served with grits. Will definitely make this again!! Thanks! Made this tonight and loved it! I used collars from our garden and omitted the jalapeño and tomato because I'm allergic to nightshades. This will definitely be one we repeat often! I loved this! I ended up with kale because the grocery store only offered collards in huge quantities. The flavors were great and I really, really, love these quick and easy meals! Would you need to double the recipe to serve as a main dish? (For two people). Excellent recipe! Thank you so much for sharing it. This is definitely a dish I will make again and again. Can you substitute Swiss chard? I loved everything about this dish. Eady to make. Full of flavor. One of my favorite recipes now. I was in the Navy with Russ! Wat to go buddy! this was fantastic – my family of four ate the entire dish…my daughters loved it – we picked up fresh naan from our indian restaurant down the street and paired it with that….awesome! and i substituted kale and swiss chard for the collard greens….but i might try it with the collards next time. thank you! Made this tonight using only half pound of 93% lean ground beef but still keeping the spice & vegetable amounts the same. (I like lots of spice!) This gave me two very generous & veggie-rich servings, one to eat tonight and one to take with me for lunch at work tomorrow. The only other thing I changed is I used fresh grated ginger and one dried red chile instead of the jalapeño, as that is what I had on hand. If I was making this for family or friends, I know they would miss a starch. It would be good with a side of roasted or braised sweet potatoes or a flat bread such as naan or chapati. Absolutely amazing!!! Hubby (who loves processed foods and hates veggies and anything green), LOVED this! Told me to add it to our rotation! WOOHOO! Made this last night using Kale and added some green peppers. This was delish!! Made this last night–phenomenal–will be part of my regular rotation from now on! I LOVED THIS!!! It was so easy and so delicious!! I added some extra roasted veggies that were on their last legs in my fridge but kept everything else exactly as is. DELICIOUS!! THNAK YOU! Delicious! Great flavors and smelled amazing while cooking. I tend to like things a little spicier, so I'll likely add some red chili flakes next time, but it was still great as is. Made this for dinner last night and absolutely loved it! So easy and so delicious. I used a mix of greens (kale, collard, spinach and mustard) and worked perfectly! I also added an extra jalapeno for a little more kick but the recipe as written is just wonderful! Thanks! Gina, this was PHENOMENAL. I was skeptical about the spices, but I followed the recipe and I loved it. I used collards and kale. I paired it with sweet potato cornbread (the Southerner in me) and it was crazy delicious! I absolutely love your site. Gina, i made this as is for dinner on Friday. One of the best things I've ever eaten! We liked it so much I made a double batch on Sunday with ground turkey, for lunches for the week! Good lord, Gina. This was a home run, appealing to my love of interesting, new, ethnic recipes and my complete devotion to the Lebanese cuisine of my family background. I knew Kenya had some Arab influence and it really showed in this recipe. I didn't have collards, so used a mix of kale and beet greens (and doubled the amount to get more vegs in). I served with roasted yam cubes, which was a perfect accompaniment. I know that in West African they eat a lot of sweet potatoes but wasn't sure if they do in Kenya, but still they went nicely with the dish. This is going to be a repeater. Thanks again! Oh and for those of you who want a little more of the spices (I am similar in almost all recipes), if you add rounded spoons (either the half-teaspoons or whole ones), it will give you the perfect amount, I think. This was so good! Even my husband loved it, and he is a very picky eater! I made this last night and my family LOVED it!! I added 2 jalapenos for more heat and flavor. I liked the flavors all though I would have used more of each of the spices. In my way of thinking, collard greens do not wilt in 4 minutes. I put a lid on the pan and cooked the greens for at least 10 minutes and then added the tomatoes just long enough to heat through. Nice flavors. Recipes definetly needs help. Made this for dinner thus evening. Used Kale. Delish! I really wanna make this tonight, but not sure how kids (2 & 4) will take to it…. Anyone have any luck feeding it to toddlers? Maybe leave out the jalapenos. I ate similar dishes as a toddler, which is why I loved this so much. But never with the jalapeno, though as a grown up I adored the pepper's spice. I didn't notice the jalapeño flavor at all, really. Which means you can probably leave it out and won't change the taste much. I don't care for cinnamon with meat and veg, would it be ok without? Is it a big presence? it would be fine without. I would have liked more of all of the spices, personally. 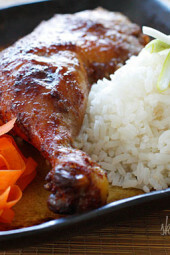 It is certainly not the predominant flavor, just adds a little somethin'-somethin' essential to such a dish with so many warm and sweet-ish spices. I think if you keep the ratios, you might like it but I agree that you can leave it out if you really hate it. I think you might not like the blend though, if you don't like warm or sweet spices with meats, though the jalapeno adds a great heat. Just made this for dinner and it got rave reviews! Thanks for your endless creativity — helps keep me on track. I made this tonight and used kale and spinach because that's what we had. I served it with hominy. Thanks for the recipe! A huge hit with my family, who prefer GF, DF, Paleo friendly and low points dinners! Next time, I would double all the veggies to have a bigger serving. My daughter wants me to make it again tomorrow night. We loved loved this! Made it with kale from the garden I needed to use up, and added about 1.5 cups of diced yellow potatoes. Sauteed the kale and other ingredients with about 1/2 cup water for 15 minutes before adding the tomatoes….to let the kale get more tender and cook the potatoes. We will make this again for sure. Sitting on the stove ready for my family to eat! The house smells amazing, too. Excellent recipe! I have some ground beef on hand (which is rare actually, on sale) and didn't know what to do with it. I love collards and these flavors are perfect. 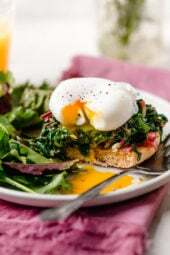 I am going to make this tomorrow using a kale, spinach and Swiss chard mix that I have in the fridge. Can't wait to try it. should be good with those softer greens. The collards were tough. I have been looking for something that's a little different for ground beef, but still uses common ingredients – this looks perfect! Looks awesome, easy and fast!!! Thanks for sharing! That looks so delish! I love the back story too. Thanks! would this be good with ground turkey? This looks yummy! Would you serve this as the entire meal or are their certain sides that go well with it? They eat it with a flatbread in Kenya, but I had this as a meal. Yummy! 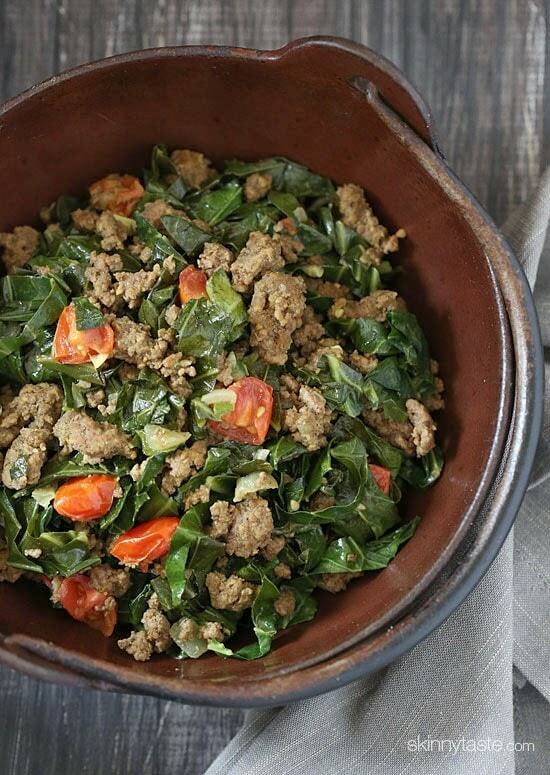 Mixing collard greens and beef looks like a delicious but healthy way to enjoy this dish! Do you know what the calories would be if I used ground turkey? Could you substitute spinach? How much would you use? i take this like everyday,one of my favorites here in Nairobi. When it comes to the Jalapeno, does it have a strong taste in this recipe? My kids are 5 and 3 and hate spicy anything lol. As long as you seed and devein the jalapeno you will get the nice flavor with none of the heat. Just be careful not to touch your eyes while handling it! And make sure to rinse your knife and cutting board if you're still using them after the jalapeno!!! Am I missing how much lemon juice to add? I don't see it. Yum, yum, yum! 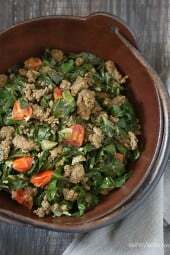 I love the idea of making collards the focal point and supplementing with ground beef. Thanks for sharing! Hi Gina, I have been a fan for years. Please, please make your book available for purchase in Canada when it comes out! I believe it will be! I make almost this exact recipe, but I use cabbage. Super yummy! Would one head do it or do you use more? I am SO happy you posted this! My CSA is starting in May and we get TONS of greens early in the program. This will be a wonderful recipe to make sure I am using them all in my meals. Thank you! This sounds delicious! One of the best meals I ever had came from an East African food cart at a farmers market in San Diego. This looks similar but the dish I had was vegetarian. Any suggestion on a meatless substitute? Diced mushrooms would probably be great! We moved to Nairobi from the USA last year, so it was a fun surprise to see this recipe posted today! We have sukuma wiki nearly every week. You can just leave the meat out if you are vegetarian — here they tend not to put any meat in it anyway; they just make it with the greens (they often do a blend of the sukuma and spinach to improve texture), onions, garlic, and tomatoes. Typically it is eaten with ugali or Kenyan chapati! I think I know which cart you're talking about and it is delicious. I had it over at the Oceanside Farmer's market on Thursdays. Would I be able to substitute kale instead and get a similar flavor profile? How much kale would you use instead of the collard greens? I was immediately thinking of kale in this recipe! I think I will try substituting with kale, I'm sure it will be awesome!